Who are the key players in the UK passenger railway industry? Great Western Coffee Shop > All across the Great Western territory > Who's who on Western railways > Who are the key players in the UK passenger railway industry? The rail industry is a complex one. Gone are the days of "British Railways" when the whole thing was owned and run by one nationalised organisation ... these days you have a plethora or organisations! DfT - the Department for Transport. The Department for Transport specifies a minimum level of service it would like to see running on groups of lines / services and invited bids for companies to provide those services under franchise. The Train Operating Companies are the franchise winners; they are public companies, operating the services which they are required under the franchise, plus others if wish. As public companies, their primary loyalties are to their shareholders, and their second loyalty is to the organisation which awarded them the franchise - the Department for Transport. Train operating companies are free to run extra services beyond those specified in the franchise - it's a commercial decision, but subject to the availability of paths for the trains and rolling stock, and competition restrictions. Companies without franchises are also free to run commercial services, also subject to the same restrictions. Network Rail owns, maintains and runs the structure of the railway, the tracks and signalling systems, and a handful of the larger stations (most stations are run and maintained by the predominant TOC at the station). Network rail is a not for profit company owned by the nation, but its assets do not appear in the government's accounts. Local Transport Authorities are responsible for local transport in their own area, including road and rail. The local transport authority is typically a tier of local government - for example a county council or a unitary authority. Passenger Transport Executives are responsible for the passenger transport in certain large cities - with the (rail) transport provided under their instruction by the other organisations concerned with controlling and runningthe system that are listed in this section. The RoSCos own the trains, and lease them to the Train Operating Companies. When the railways were privatised, the rolling stock was sold to companies which have largely since that time been taken over or bought out by the big banks. Only a few trains (e.g. 5 of the High Speed Trains that Great Western run) are actually owned by the Train Operating Companies. You will note that there is scant reference above to any of the operating organistions having responsibility to passengers. Although it is clearly in their secondary interest to provide what the travelling public wants, will use, and will happily pay the most money for, that is not their main interest. Passenger Focus is funded by the Department for Transport and monitors passenger satisfaction, also taking up cases that passengers raise with them where those passengers believe that the TOCs may be operating outwith the franchise agreement. Passenger Focus has relatively few staff - just one person covers the whole First Great Western territory from London to Weymouth, Penzance, Swansea and Worcester. ORR - Office of the Rail Regulator. Passenger representatives of lines or services appointed by some of the Train Operating Companies to pass passenger feedback to the TOC, and to pass the TOC's views back to the passengers. Independent and often local groups - ranging from effective lobbying groups for their line or area, through to enthusisasts groups with more interest in the past of the railways than their future, and in some cases putting forward ideas which are very much 'thinking out of the box'. The precursors of Passenger Focus and the old Travel Watches - the TUCCs were organised around different parts of the country, and had a much more powerful representation (and more resources) that Passenger Focus, which is their effective replacement. Groupings which look after the interest of lines for which special local consideration is appropriate. Acorp - The Association of Community Rail Partnerships is a federation of over 60 community rail partnerships and rail promotion groups. Organisations whose primary task is to represent the staff who work on the railways to the railway management with regards to pay, terms and conditions, safety, and other matters related to their members employment. Industry association advocates on behalf of its member companies and provides them with shared marketing, accounting and operational services. Responsible for land and structures thereon which were part of the British Rail 'empire' but which were considered to be surplus to requirements / used for non-rail activity at the time that British Rail was privatised. National Rail Enquiries (NRE) is the definitive source of information for all passenger rail services on the National Rail network in England, Wales and Scotland. NRE is part of the Association of Train Operating Companies (ATOC), which is responsible for providing business services to the Train Operating Companies. Responsible for safety - the safety directorate (formerly Her Majesty's Railway Inspectorate) is responsible for new works and standards, and the RAIB for learning lessons and improving safety as a result of accidents. Re: Who are the key players in the UK passenger railway industry? Does the system work? Well - with some gaping exceptions, most lines have a train service that runs on time (or close to), more or less at the times that people want to travel by train. But it can be much slower, and much more costly than we would like, at times it can be overcrowded, and the infrastructure is very old (time expired?) in parts. Information can be very hard to find. There are some good people - some VERY good people - running the railways both from a management and from an operational viewpoint. In fact, in the majority of cases I can't find enough words to praise their professionalism and courtesy - it's usually a pleasure to travel by train, and made all the more so by the majority of staff with whom you come into contact. No - the problems that I list below are typically not people based but systemic issues. Here are some of the criticisms levelled at the system; the reader may consider some of them to be unfair, and there are certainly compromises involved which mean that an improvement in X neccessitates a step backwards in Y. 1. Service Specifications. The service specifications are sometimes said to be micromanaged by the Department for Transport in an attempt to ensure that services are run to suit the DfT's need. And even a micromanaged specification can provide anomolies which are intended to serve the passengers to a minimum level, but fail to do so. For example - laudable aim "must be a train at least every 3 hours calling at Dilton Marsh". Problems (a) doesn't run to major destination from Dilton Marsh of Salisbury, (b) in the evening peak, there's a 2 hour wait at Westbury for commuters who leave Bristol at about 5 p.m. (c) ties up a train at certain times of day for a service that's almost empty. 2. Profit over passengers. The DfT sells the franchises to the highest viable bidder, and that bidder then wants to make as much extra money as they can for their shareholders. Note lack of "public / passenger service" in this scenario. For example - Cross Country Franchise was awarded to bidder who reduced cost by slashing long distance train catering, Great Western franchise awarded to company who cut train length by 1/3 on rapidly growing Cardiff / Portsmouth service. 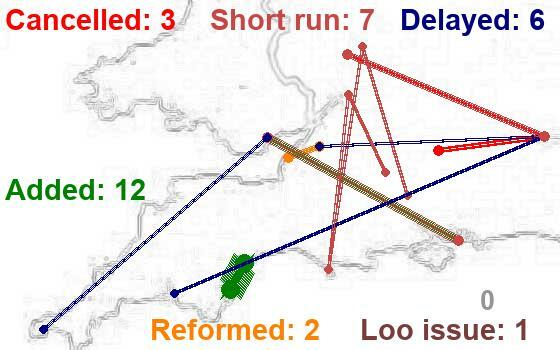 Train company operating Westbury / Trowbridge to Chippenham / Swindon route (one of the top 50 commutes in the South West) does not provide peak hour direct trains, but has people use a dogleg route and change trains, adding approx 45 minutes to their daily round trip commute. "What is there to motivate us to provide trains when we take the farebox money anyway?" one of their employees asked me. 3. Lack of trains. There is a shortage of trains of certain types available for the TOCs to lease. With 7 to 10 year franchises, they don't buy the capital stock but lease it, and the ROSCOs want to make as much as they can from the scarse asset they have. There is little encouragement for the ROSCOs to build more trains due to the changes and shorttermism - they make more money by leasing out 10 ancient trains than 20 new ones. 4. Overcomplex. Where to I start - let me just quote an example: Ask about improving train services on the TransWilts. The Dft point you to FGW, who point you to Wiltshire Council, who point you back to the DfT. No-one takes responsibility. Wiltshire Council have done a number of studies, so have Network Rail (excellent cost benefit study published 1.9.9 as part of the draft GWRUS) all of which come out in favour of a service that's at least once every 2 hours. But WC now has put aside a further 25k to get another consultants report written to DfT Standards. That money would seed an improved service for a year. In the case of one line (NE England) it was quoted that the admin / franchise costs raised the price of a service 3.5 times on privatisation. 5. Too many changes - both in systems, in franchise holders, and in personell. There is a huge lack of continuity. Look at TUCCs -> Travel Watch -> Passenger focus, at the various successive franchise holders, at the top management changes to staff at those franchise holders. I have been campaiging for an improved train service for Melksham for 4 years. There have been 4 separate MDs in charge of the company providing the service, and 4 or 5 ministers of transport in that time. 6. Fares. The fare system is so complex that it's disreputable - headlines talk about high fares and that's often the case, but there are equally underpriced bargains and ways of legally reducing your costs (e.g. splitting or buying a ticket for a longer but cheaper journey). On one hand, people are frightened off the railways by the cost, and on the other hand revenue opportunities that should buy a better service are being lost. And because the system is so complex, people are sometimes mis-sold tickets, misadvised and then at time harrassed by a penalty fare / "Revenue Protection" system which chases fare dodgers and catches the uninformed in the net. 7. Lack of effective passenger representation. Take a look at all the organisations listed in the industry, and you'll be hard pressed to find one that looks at the existing travellers and the wannabe travellers - those who would use the trains if they ran at the right time / affordable price - and represents their interest for future planning. PF is good for the immediate issues like "trains not washed as often as the spec requires", but powerless and without resources when it comes to "is a service of just 2 trains a day - at 06:15 and 18:45 - from Swindon to Salisbury the correct level and timing for the passengers?" 8. Subject to political whim. It's probably no accident that services such as the TransWilts, through a Tory area, languishes with a poor service whereas other routes such as the line to Workington (labour MP defending a slipping majority) has an hourly train. 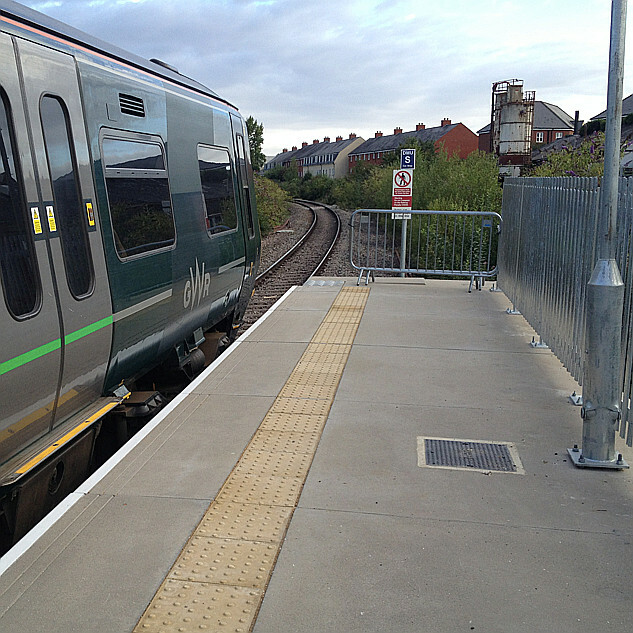 Major improvements made to the railway infrastructure at Lincoln ... when the MP was also a transport minister. 9. Local control over long distance service. Local government looks after services in its own area. Whilst it needs input / influence over local transport, so often that transport crosses boundaries and the LTA is responsible for perhaps one or two stations. People tend to live in one area and work in another. Example - net daily outflow of 6,000 from West Wilts to work, primarily in Swindon, Bath and Bristol. Even with Wiltshire now being Unitary, you have 4 Local Transport Authorities involved with no journey exceeding 30 miles. 11. Franchises are too short. There isn't time to invest within the 7 to 10 years of the typical franchise - it's all down to short term ism, getting as much revenue out of what you have at day 1. Plan ahead through the complex rail system, and expensive new facilities will just about be coming on board as the franchise ends, leading the TOCs to hope that can regain the franchise for a further period. One heck of a big gamble that few will take. 13. Lack of integration. The bus leaves the station a minute before the train arrives ... there's no bus stop at the station ... the connecting train doesn't wait for the late running mainline service ... through ticketing is sporadically available only, and it's often much more expensive that buying the journey in parts. 14. Engineering works and Sunday trains. Sunday is the busiest day of the week in the UK for long distance travel - and yet the railway network often has large sections closed at the weekend for engineering works. There ARE improvements being made here, but it's still very much a case of "could do a lot better". On some services (LM recently), issues can arise where the whole Sunday service is cancelled and very often TOC performance measures excvlude Sundays. 15. Lack of information. It's sometimes very hard to find information / the correct information. Example: I bought a saver return, Melksham to Peterborogh, and asked at Paddingon if I could use it on the 17:30 train; I had been sold it for this train, but the station indicator boards said "saver tickets not valid". I asked two uniformed staff members. One said "yes" and the other said "no". Another example: I asked for a pocket timetable for the TransWilts line - services from West Wilts to Swindon on a route which, you will recall, is a high commuter low. The two daily through trains are shown in book no. 25 (? ); connecting services you have to work our for yourself with a combination of books 25 and (?) 2, working out your dogleg changes. The TOC's website will only give you a "personalised timetable" for a period of a few hours, and gives some strange routings too. 16. Low regard for passengers. There's an assumption in some quarters that the passenger doesn't know about rail (and that can be very right - I know that I trusted the rail industry to provide a sensible service until I was rather forced to look under the bonnet from 2005 onwards) and is out to defraud the railways ("I expect 90% of people travelling in .... to not have the correct ticket" says a staff member to me). And this low regard can rise to a higher level - "we're the professionals - you don't know what you'r talking about" attitude. And you'll note - profit over passenger convenience! 17. Poor, mouldering infrastructure. There's a lack on incentive to invest in better facilities, and whilst some low cost, headline grabbing works arfe done, this is by no means universal. For example, Melksham station which serves a town with a population or 23,000 hasn't been significantly improved in the life of the current franchise. Additional signs have been added to say that the station is checked regularly, and to prohibit smoking, and some painting has been done. But the passenger information system, which remains a simple push button operation to give a recorder massage only and was due to be replaced early in the franchise, remains and is often out of service. There is no public telephone, no staff, and just a bus shelter on the platform. The timetable boards show trains from Cardiff to Portsmouth, and advertise cheap day fares to London (not available from Melksham as FGW have withdrawn the off peak trains!) and timetables are NOT available to show the most common journeys - to Bath, Bristol, Filton and London. There is no ticket vending machine - advance tickets from Melksham must be collected an another station, such as Chippenham ... which requires an extra journey at extra cost before you travel. 18. Cap and Collar remove incentive for operational profit. In the current recessionary environment, the train operating companies have their farebox income (or 80% of it) guaranteed by the DfT - which means that they have no incentive to improve services for passengers ... they loose 3/4 of any extra money they take, so why bother? $64,000 question ... what can we do to help make things better for the traveller - that should read "even better" in some cases, but in other cases such as the TransWilts it's a far more dramatic "what can we do to help the various organisations provide a service that's fit for the purpose of servicing a travel need". I will follow up on that question! The $64,000 question ... with a number of the things listed above (and probably others) which are less than idea for the development / maintainence and running of a railway system which sees as its first priority the meeting of customer needs, what can / should be done to help improve the situation? Reasonable trains, when and where they're wanted, reliable and with sufficient capacity, at a price that's understandable and affordable and doesn't break the taxpayer's bank either. Secondly, work WITH the experts. In ALL the organisations listed earlier, there are excellent and knowledgable people who are doing their very best within the system and DO take as much of a view as the system allows of customer requirements. That's not saying "everyone", it's not saying "they don't make mistakes" as we all do, and it's not saying that there are some people around who put the traveller's needs way down their priority lists. It's saying that there ARE good people there, they DO know there stuff, and we take an adversarial role that might leave them less helpful / able to help at our peril. Much better to build on their skills, respect the information they can provide, and help build towards customer needs. Thanks Graham for a very helpful summary. I've only just recently got to the point of even understanding all the terms in the list and can understand the frustration that councils feel at the thought of engaging enough to get a real step-change in rail service, and hence why WECA is now pinning their hopes on MetroBus (and Marvin Rees on a Bristol Underground) instead. The most useful meeting in recent months we had was with the DfT in February where you were too, Graham - it did seem that DfT is the one organisation at the hub intersection of all these players and they have at least the knowledge, if not the power, to have an enlightened view on how things could go forwards. But when we put it to them that they should take responsibility for co-ordinating such a forward plan they then said it was not in their brief. So I am hoping that Transport Focus could be made to be such an intersection where people could be brought together to consider conflicts of interest. Is this likely? * ORR now stands for "Office of Rail and Road" rather that "Office of the Rail Regulator"
... and on my follow up suggesting what's in need of some TLC (Tender Loving Care, not more Three Letter Codes!) there's plenty that still current, some things that really have moved forward, and some more that may have moved, but I might not like to say they've moved entirely forward. Yes, I've always taken the view that we should work with what's there (TOCs, WECA, Railfuture) rather than wanting to go back to the drawing board or (as some not-to-be-named people say) boycott the people out there trying to work within the system. So one way forward might be to ask DfT to beef up Peter West's team to provide meaningful overview of current operations and forward planning to paper over the franchise gaps? Or might Transport Focus provide that role? There are also some other changes of note since the original post. Network Rail has been reclassified as a nationalised organisation since 2014, being no longer a 'not for dividend' company, so (a) it can no longer borrow money on the commercial markets and (b) its debt, accumulated since the Control Period commencing after Railtrack was put into railway administration, now appears on the Government's books as part of the National Debt. This change has had a significant effect on the way that NR plans, funds and executes enhancement projects. One of these is the devolution of many, mainly day-to-day operating and maintenance functions, to 'Route Managers' rather than being centrally organised. Another, potentially significant, development is the emergence of the 'Rail Delivery Group' in 2011. This grew out of the Association of Train Operating Companies (ATOC) with the addition of Network Rail, HS2, the freight operating companies (FOCs) and an industry body, the Rail Supply Group (RSG), representing companies supplying and supporting the rail industry. Other, somewhat surprising, members are Iarnród Éireann and London Underground Ltd. It is an unincorporated association owned by its members but is the first time since the demise of BR that all parts of the rail industry have met as a single body and is, in my opinion, the only body which could take back some of the detailed planning functions which have ended up with the Department for Transport after the Strategic Rail Authority was abandoned. Clearly, as an association, it cannot have any executive functions but one could see a rôle whereby it could prepare proposals for enhancements to the network taking into account the needs and desires of all the affected participants and prepare the business cases before submission to the DfT for funding as a replacement for the discredited High Level Output Specification / Statement of Funds Available (HLOS/SoFA) procedure prescribed by the 2004 Railways Act. One pressure group, Rail Forum East Midlands, is already an associate member so possibly it might be worthwhile investigating whether the Community Rail Groups should also have a voice. Thanks, that's helpful. How does the Rail in the West conference on Monday 19 March 2018 and its One Plan they published? - It's at https://we.tl/pt2KTgAizS - at the end it points to a website called Britain Runs on Rail. www.britainrunsonrail.co.uk/west - is this the same as the Rail Delivery Group? Did anyone go to the Monday 19 March conference (it was too expensive for FOSBR to send delegates) - and if so what did they make of the conference and of the One Plan? To my jaded eye it seemed to just be promising on delivering on what is already in the various franchise specifications. I'd like to be persuaded otherwise! A statement of intent to deliver for Britain to run on rails (or on buses?) is no bad principle - be it within franchise agreements of not. As far as I can see from the 'BritainRunsOnRails' web site is that 'BritainRunsOnRails' is the public face of the Rail Delivery Group. I wonder why they felt the need to do this particular "One plan" and press release to such fanfare - maybe to lay claim to the £billions and make the point that all the £billions are needed to deliver and improve existing services (rolling stock and staffing which is probably the main element behind the recent troubles) and we should not get too excited about bagging those £billions for new rail lines and stations?